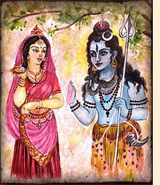 The Glorification of the Bhagavad Gita from the Padma Purana as told by Lord Shiva to Parvati. Parvati said "My dear husband, You know all the transcendental truths and by your mercy I have heard the glories of the Supreme Personality of Godhead, Lord Krishna. Oh Lord, now I long to hear from You the glories of Srimad Bhagavad-gita, which was spoken by Lord Krishna, and by hearing which, one's devotion to Lord Krishna increases"
Bhagavad-gita is a transcendental literature which one should read very carefully. Gita-sastram idam punyam yah pathet prayatah puman. If one properly follows the instructions of Bhagavad-gita, one can be freed from all miseries and anxieties in this life and one's next life will be spiritual. "Abandon all varieties of religion and just surrender unto Me. I shall deliver you from all sinful reactions. Do not fear." Thus the Lord takes all responsibility for one who surrenders unto Him, and He indemnifies such a person against all reactions of sins. Bhagavad-gita comes from the mouth of the Supreme Personality of Godhead, and the Ganges is said to emanate from the lotus feet of the Lord. Of course, there is no difference between the mouth and the feet of the Supreme Lord, but from an impartial study we can appreciate that Bhagavad-gita is even more important than the water of the Ganges. In this present day, people are very much eager to have one scripture, one God, one religion, and one occupation. Therefore, ekam sastram devaki-putra-gitam: let there be one scripture only, one common scripture for the whole world, Bhagavad-gita. eko devo devaki-putra eva: let there be one God for the whole world, Sri Krishna. eko mantras tasya namani: and one hymn, one mantra, one prayer -- the chanting of His Name: Hare Krishna, Hare Krishna, Krishna Krishna, Hare Hare / Hare Rama, Hare Rama, Rama Rama, Hare Hare. karmapy ekam tasya devasya seva: and let there be one work only -- the service of the Supreme Personality of Godhead.